How to find the Schedule of a Train? For passengers, it is important to find out about the train schedule of a particular train on which they are planning to travel as it provides you the complete information about the journey of the train and how many stoppages it will have during the journey and the estimated time of arrival of the train at a particular station. How to find the Train Schedule? Open any web browser and head over to “http://www.indianrail.gov.in/enquiry/SCHEDULE/TrainSchedule.html“. 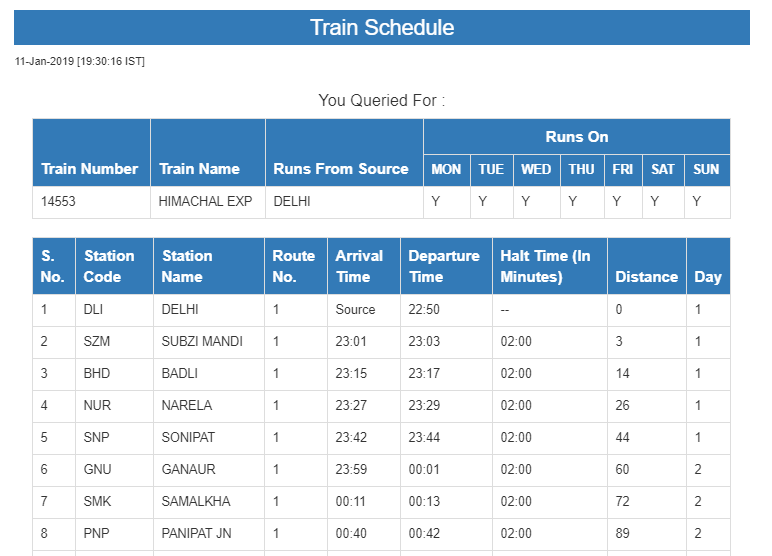 Type in the name of the train or the number of train e.g To get the train schedule for Himachal Express i.e. Train No. 14553 — either enter Himachal or 145. Enter the captcha to prove your verification. The Train Schedule will show up. The Train Schedule for any particular train provides a lot of useful information. This information can be really useful for passengers to plan their travels accordingly. It tells you about the train that on which days of the week does the runs. “Y” means Yes while “N” means no. This tells you about the estimated arrival time of the train at a particular station and its departure from that particular station. The shown is expected time and it can vary if the train is delayed. It also tells you about that on which day of the journey will the train arrive at a particular station. It is the time in provided in minutes. It the time that the train will stop/halt at a particular station. It is provided in minutes and the train will stop a particular station for that amount of time. Along with the aforementioned information, the train schedule also provides the source station from where the train will start its journey and it also tells you how many stoppages will the train have during the journey. Therefore, it is important to check the train schedule before making a reservation. ← How to check the Train Seat Availability Status?